Remember the days when major musical artists wrote and produced original songs for films? Top Gun had "Danger Zone," Rocky 3 had "Eye of the Tiger," Space Jam had … "Space Jam." That trend never really caught on with video games, but CHVRCHES is certainly going to try. 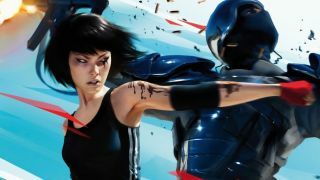 The Scottish synthpop band has crafted "Warning Call," a song written from the perspective of Faith from Mirror's Edge Catalyst. You know, it's actually pretty catchy, if a little on the nose with the lyrics. The electric beeps and slides fit nicely with the futuristic aesthetic of the game, and I'd say it successfully follows in the footsteps of Lisa Miskovsky's "Still Alive" - an original tune created for the first Mirror's Edge. I can totally see Faith leaping from rooftop to rooftop with this in the background, as the camera sweeps and pans to showcase her talent. "You can run for the skyline, your eyes are open wi-iiide…" Okay, yeah, that's going on the iPod.